This has to be one of my favorite photos of 2014. The bride Raychel had 5 bridesmaids but one of them ended up going into Labor a week before the wedding. As we were shooting the bridal prep, one of the girls called the 5th bridesmaid and put her on Facetime. This is when I LOVE technology. 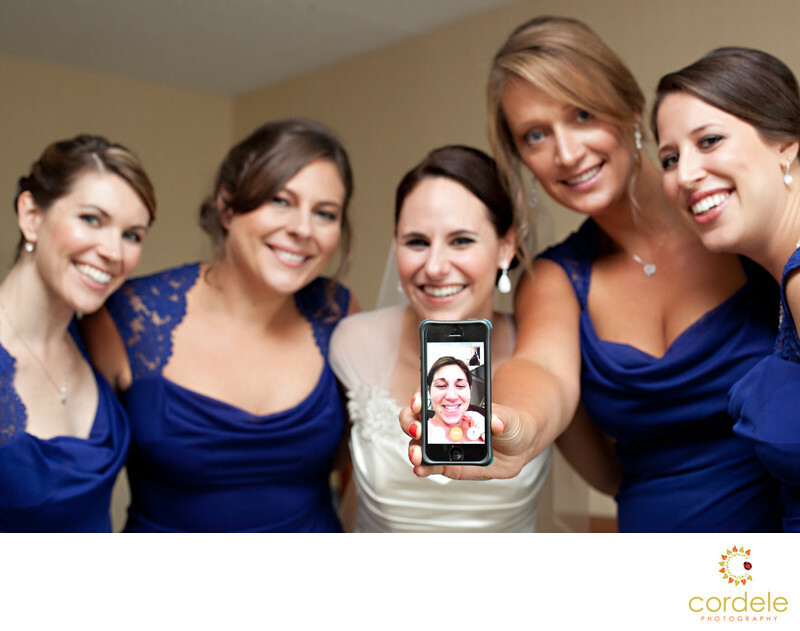 This bridesmaid was able to partake in the day and see the bride. When they got on the phone with her you could tell this group was a tight group of friends. Raychel was so happy to talk to her and there were tears shed. We wanted to make sure to get a photo of all 6 of them together, so I had one of the bridesmaids hold out the photo and put the other girls slightly out of focus. The girls had no idea what the photo I was going for would look like, but it was one of the brides favorites. The bride even got to see the new baby, and the bridesmaid on the phone found out another bridesmaid was expecting as well!! Location: 226 Main St, Sandown, NH 03873.